You can have one great brush or 25 different kinds of sizes. I have learned that the best and of course the most expensive are the real/natural hair (not synthetic) type of bristles. Sable or natural hair bristles are just an all around better product and will improve your design and handling much better. Cheap synthetic detailed brushes are just that cheap, don’t last long or give you the finish you’re looking for. I actually find it a lot harder to control. Paint just doesn’t stick to them very well. I tend to buy at an Art Store not a Craft Store and I buy individual brushes not in sets. Natural Nail Artist Brushes If you’re using your brushes for and with nail polish and nail polish remover then buy the cheap as possible brushes. For acrylic paint only my suggestion is the natural hair artist brushes. Don’t let the paint dry on them and soap is the best for washing and leaving soap on them to dry. This keeps the bristles in shape and the soap acts like a glue to hold them together. 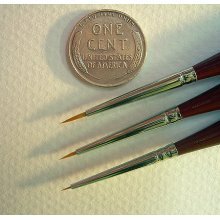 Striper Brushes ( for very fine lines ) These are Sable bristles not the synthetic ones. There is a knock-off on ebay.